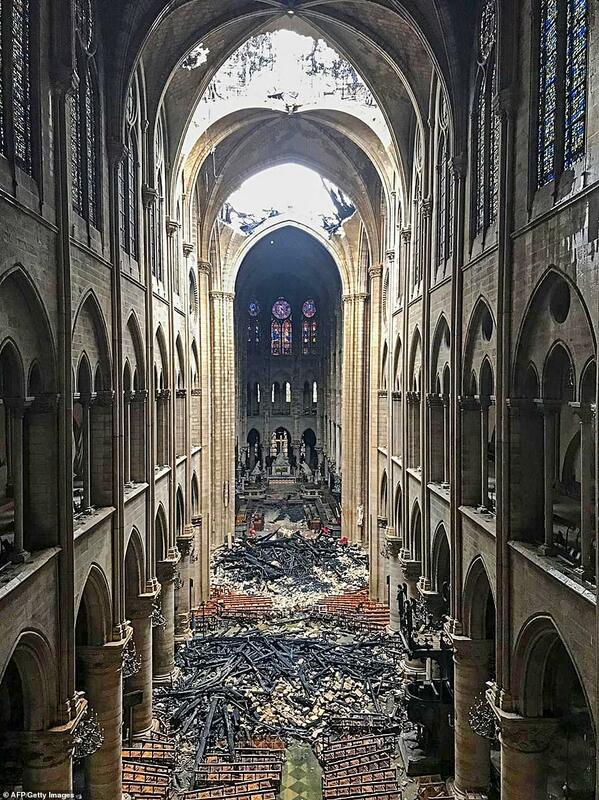 Emmanuel Macron said he will launch a national "subscription" to raise funds for the rebuilding of the cathedral. What exactly does that mean? He's going to go door to door soliciting subscriptions to Pèlerin, Voici, Lui, Le Débat and Paris Match? Anyway, KFI is reporting that France has no oak trees large enough to provide beams for the roof. There may not be large enough oaks anywhere in Europe. Oh dear, oh dear, whatever shall we do? Possibly subscriptions to Ooh La La or Oui magazines? My take on the reconstruction is that they should use glue-lam beams or trusses, or even steel. As long as the visible roofing material looks historically accurate, they should use whatever modern material underneath it that will perform best. After all, when the building was built 800+ years ago, it was cutting edge technological. And they need to finally install a proper sprinkler system. Today in a televised address, Emmanuel Macron declared, "We will rebuild Notre Dame even more beautifully and I want it to be completed in five years. We can do it." Rosie the Riveter would be proud. The billionaire husband of actress Salma Hayek and his family have pledged €100 million ($113 million) to help rebuild Notre Dame. Wow! That's an awful lot of Gucci watches and Saint Laurent handbags! Getting the cash is hardest part. I think they are closing in on $700 million already. I can't begin to imagine how much it'll cost to rebuild it. 5 years sound pretty ambitious to me. 7 or 8 seems more likely. Even though they won't likely change the basics, it's still going to take a lot of time detail everything. The committees are going to slow everything down like crazy. As chairman and CEO of LVMH, Bernard Arnaut oversees 70 luxury brands incuding Sephora, Louis Vuitton, Dom Pérignon and Christian Dior. As of today, his net worth (according to Forbes) is $92.6 billion, making him the world's third-wealthiest person. Arnaut is donating €200 million ($226 million) to help rebuild Notre Dame. C'est très généreux. That is 0.2% of his net worth. It sounds like they are closing in on $1 billion already. I would think they are most of the way there. Maybe another $500 million. The stained glass will cost a ton. The insurance from the construction company should be kicking in something pretty big too. It's amazing how good the interior looks. It's interesting to see how much of the blaze was contained between the groin vaults and the wood roof beams. It must have been like a blast furnace up there. I am wondering why they did not have fire insurance. Seems running a church without insurance is a bit risky. NBC is reporting that a smoke alarm went off at 6:20 PM, five minutes after evening Mass began. Notre Dame personnel were unable to find any fire but the cathedral was evacuated as a precaution. It was not until a second alarm went off at 6:43 that they discovered the fire in the attic and phoned the fire department. 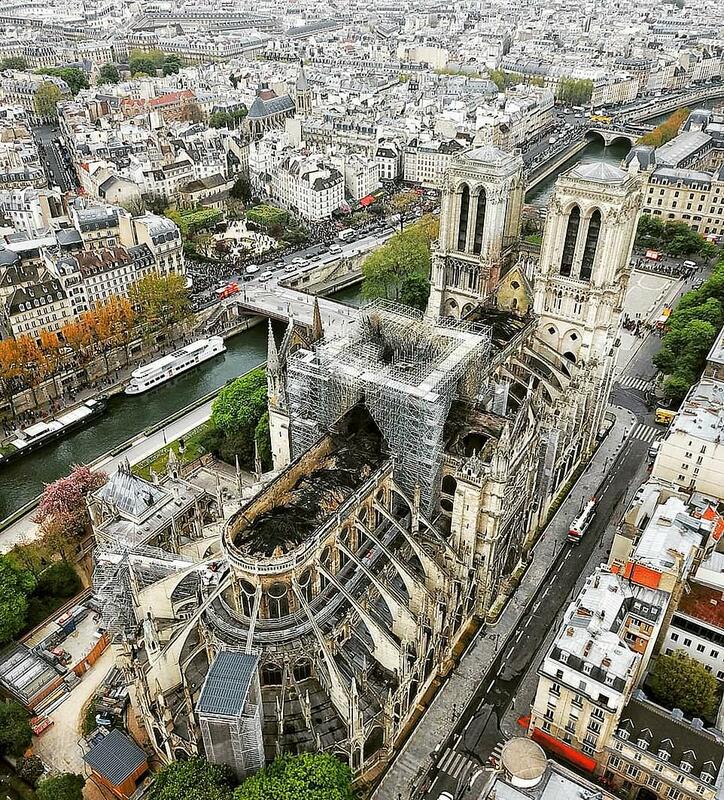 Had they noticed the fire earlier, Notre Dame's roof might have been saved. Donations to help rebuild Notre Dame have topped one billion dollars. CEO Tim Cook said Apple would be making a huge donation and Sotheby's of London raised $900,000 by auctioning off 25 cases of Château Mouton Rothschild wine. 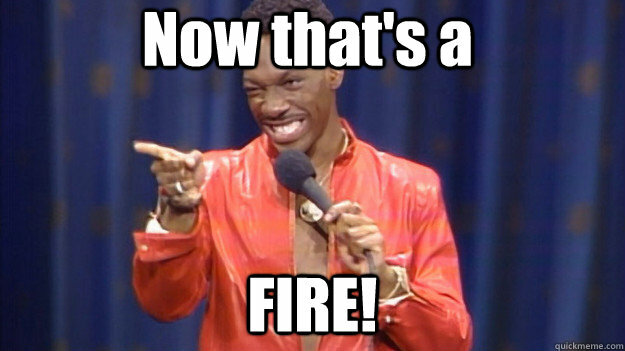 "Duh, that big fire at that Noter Dames place was purty excitin'. I wanna start a fire like that here in New York. I'll be famous! " The cops should do like they did when we were kids and they caught us with beer, and make him drink it all instead of pouring it out.